Castle Dracula did not have as much advertising as the Brigantine Castle and the Haunted Mansion of Long Branch, but there were a few radio and television commercials produced. Unfortunately, we have not come across any of these commercials for inclusion on our website. If you have any copies of Castle Dracula TV or radio commercials, please drop us an email. We would love to include them on our site. Radio Commercials: During the 90s, I worked on the boardwalk in a dollar store and I remember a commercial that would play constantly on the radio. It would be so outrageous because it would talk about things that were not really inside the castle such as the the black mask of Satan, and the sacrifice of a mutant virgin. I remember it started by describing how Castle Dracula was transferred "...brick by brick from the Carpathian mountains of Transylvania..." I use to get a real kick out of the commercial, but I guess I took it for granted because I never made any effort to audio record it. Hopefully we will come across a copy of this and other radio ads so that we can include them on the site. TV Commercials: We remember seeing a couple different television commercials for Castle Dracula during the 80s. One of them was a combination commercial for Morey's Pier and Nickel's Pier. The commercials were not near as creepy as the Brigantine Commercials, but they were still interesting. Billboards: Several Castle Dracula billboards were produced to advertise the castle over its 20+ years of existence. These billboards could be seen above the old carousel building at Cedar and the boardwalk. Originally, there was a grim reaper billboard advertising the castle. The billboard that seemed to last the longest was a yellow billboard featuring a goofy looking Dracula and a bat. Then, in the late 80's, a billboard was produced that featured the Crazy Eddie character from Iron Maiden. Below are some pictures of two of the billboards. Print Ads: Although Castle Dracula did not have stickers, posters, pins, or shirts that you could purchase, there were a few brochures and postcards that included pictures of the castle. 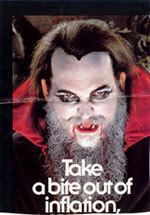 Below is the original Castle Dracula brochure which was printed in 1978. At this time, the pier was still called Marine West. A special thank you to Ed Azarian for sending us a copy of this brochure from his personal collection. Click on one of the thumbnails to see a larger image. Anita Wheeler, former manager of Castle Dracula, sent us part of an old castle ad that appeared on the back cover of a Sunny Days magazine. Click on the image below to see a larger version. Anthony Pizzuti sent us a scan of an ad for the World of Wax that was located at the front of Nickel's Midway Pier. Click on the image below to see a larger version. Diane Wilson sent us a scan of a clever advertising technique that the castle used in the 80s. An ad for the castle would be printed on the back of a fake 10 dollar bill. After picking up the bill on the boardwalk, you would unfold it to discover that it is really an add for the castle. 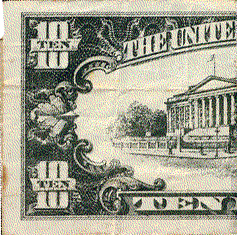 We also remember seeing these fake 10 dollar bills used for t-shirt shops. Click on the image below to see the entire ad. Robert K. sent us scans of a couple brochures and tourism pamphlets from the 80's which featured the castle. Click on one of the thumbnails to see a larger image.